This recipe is to be made 24-hours before serving. In a separate bowl, beat the egg yolks with the sugar to obtain a frothy paste. Add to the melted chocolate away from the heat source. In another bowl, beat the egg whites into a firm snow texture. Add the chocolate to the beaten egg white to obtain a chocolate mousse. Beat the egg yolks with ¾ of the sugar. Add the flour and the almond powder. Beat the whites with the remaining sugar and mix with the previous preparation. Add melted butter and lemon zest. Cover baking sheet with parchment paper. Spread cake mixture on the parchment paper at least ½ an inch high and bake at 200 ° C (400 degree F) for 10 min. Carefully remove the parchment paper by deposing the cake on a damp (clean) cloth. Spread the orange marmalade on the sponge cake, the chocolate mousse, and place small peeled orange pieces on the upper edge. Roll from the top (the orange pieces will be in the center) helping you with the cloth forming a log. Wrap in clear food wrap and leave in the fridge (if you are press for time, put the log in the freezer while preparing the frosting). Beat the egg white with the confectionary sugar and the juice of 1/2 lemon to obtain a thick paste (if it is too liquid, add more sugar). Spread the frosting on the log and streak the top with a fork to evoke the appearance of wood. Cut the ends of the log to equalize. Prepare a little black chocolate icing with 1.75 tablespoon of dark chocolate, 2 tablespoons of confectionary sugar and 1 knob of butter, it must be liquid. Make streaks perpendicular to the log with the liquid chocolate glaze. Replace in the fridge until dessert time, before serving, decorate and sprinkle with confectionary sugar. Mixing almond powder in the cake mix makes it more elastic and easier to roll. Roll the cake when it is still lukewarm to avoid breakage. Translating from the metric system to the US measures can make it less precise. For accuracy and better result with this recipe, I would recommend using the Oz. measurement with a food scale. 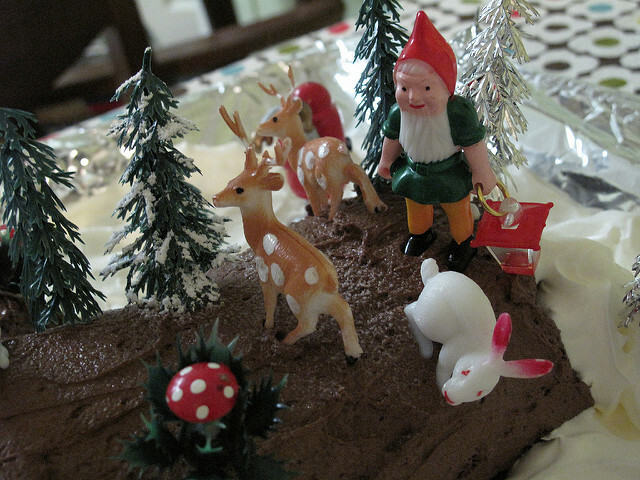 Find Yule log décor items on this website: http://www.scrapcooking.fr/en/. Order online, delivery in the US is available but expensive. I would suggest you find a French bakery in your area and see if you can buy some of the décor from them.